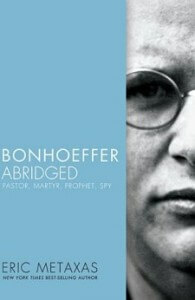 Bonhoeffer: Abridged is a more accessible version of Eric Metaxas’ 624-page biography of German pastor Dietrich Bonhoeffer. Metaxas has personally trimmed the book, and it ends up at about 40% of the size of the original. For all intents and purposes, it’s a less in-depth but still enlightening look at one of the heroes of World War II. Eric Metaxas has shown himself to be a skilled biographer in previous books, notably Amazing Grace and Seven Men. Bonhoeffer continues the trend. Metaxas is clear and concise, and relates the factual details of Bonhoeffer’s life well. He betrays his own perspective only in his descriptions of various Nazi officials, whom he colorfully calls “a vampiric homunculus,” “outspoken pagans,” and “course and crude.” These slips, rather than reflecting any personal bias, are more just general historical fact. The biography paints a consistent picture of Dietrich Bonhoeffer as a man of God wrestling with the turbulent situation in Germany throughout World War II. Though he faced perhaps the most dangerous and repressive state ever to exist, Bonhoeffer remained devoted to Christ. His life was characterized by a deep pastoral care for the people around him, and an incredible intellect that he harnessed in copious writing and teaching. Bonhoeffer was a true man of God who acted with valor at a very difficult time in history. His thoughts on church and state and how they ought to interact are relevant even today, and his life serves as an inspiration to followers of Christ everywhere. I was especially touched by Bonhoeffer’s relationship with his fiancee, Maria, whom he never married. As someone going through my own long-distance relationship, Bonhoeffer is a beautiful (if extreme) example of a strong love built on a foundation of devotion to God. This biography made me hungry for more on Bonhoeffer, and challenged me to act with the decisive courage and braveness that he did. In that, I suppose the abridged version works very well as a short introduction to the full biography, which I will be investigating. I recommend Bonhoeffer: Abridged as an excellent record of Dietrich Bonhoeffer’s life and as an inspirational book for all Christians. Bonhoeffer lived for Christ and the gospel, and that is a life worth learning about and imitating. If you have the time, I recommend the full version, based on my reading of the abridgement — that’s where I’ll be looking in the next several weeks.